This will eventually be made into a video. But I'm sick. Here you go Karen :) Hope this helps! This was my first and only tarot deck. I have more oracle decks than tarot. I find tarot are sort of like the introverts of the divination world. Because I an introvert as well, I know how important it is to get to know someone/ something especially if you on the fence about a particular subject or person. I've had this deck for about 5 years now. Do I love the deck? I don't know yet. I find tarot and oracle decks so hard to pin down, the personal experience you gain when you work with anything really speaks to your relationship. I treasure these cards as a tool, but is it love? No, just appreciation - for me anyway. I love anything that looks old worldly, or harkens back to another time or place. The Art Nouveau tarot is beautiful each card is it's own little painting. When I do readings, people often remark on how beautiful the cards are. They have a very delicate energy to them; there is almost an aloofness with the wisdom you can draw from them-they are absolutely intriguing. Kind of like the elves in Lord of the Rings, if that makes sense? While the imagery on the cards is really beautiful, it sometimes can make it more challenging to find more to them. It is a good idea to know "basic" tarot notions or be fine with going with intuitive messages (which is what I do more often than not). They have little to no symbology that you might find with the Rider Waite tarot which makes it difficult for someone just starting out. The images are like the Art Nouveau period, made for the sake of being beautiful, which is sometimes seen as the cards major flaw in a lot of reviews I've seen: "the women are just beautiful" "they don't do anything". Those complaints are kind of true, but because I'm just drawn to the cards I've soldiered on as I've done, and to my knowledge, I have done effective, helpful readings for others. The booklet that comes with it is typical to the Lllwelyn style, small, thin, fits in the box with the cards. The only descriptions of the cards it provides is the up right position, so again, you will have to have a more intermediate understanding of the cards, or think abstractly when you do get a reverse card. ough for any reading I've done, (i.e. the querent is feeling dominated by a man or a situation) so I guess it works, but it still comes off a little dated and silly- but those are my own issues coming through as well. Another complaint I've read (but not really cared about) in other reviews of this deck was that there weren't that many men depicted. Which is true, but that didn't take away from the deck. 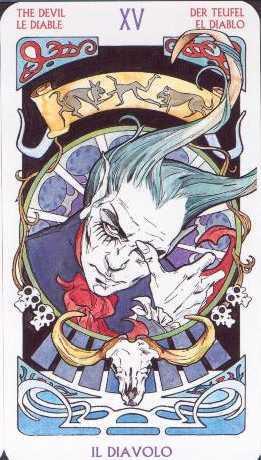 Like I said, the King cards are a bit silly (I don't have daddy issues so old men with white beards don't do it for me), but there are a few "man" cards that are gorgeous. I'd also hazard to say that they play a little too much into typical gender roles (Strength is portrayed by two males, albeit they are centaurs which are usually symbols of human ability to be wild and rational but still. )...but again that is my own little qualm. As you build a relationship with the cards, it becomes easier to notice patterns, and see the story develop between the cards in relation to the reading. These cards are intriguing to say the least, their muted colours even for some of the more sevier cards ( i.e. The Devil, Death, 9 of Swords) speak to that aloofness I mentioned before. There is more going on behind the surface I'm sure. I keep my eyes open for any new symbols or signs in the cards. The cards like Death, the Devil and the 9 of Swords are some of the most striking cards in the deck. Their colours and what they invoke do a lot for me. I'm often stunned when I do readings and they pop up. No idea why as of yet. I cannot say I'd recommend them, but I wouldn't dissaude anyone from getting them. I'm super picky and immediately contrary when people say "oh you will just love this" I make it my personal mission to hate it, or find something "wrong" with. Only later will I come around to my true opinion, and sheepishly admit that "you were right". I can't say that I love the cards, but I've had a hard time finding another deck of tarot cards that I want to work with. There is more to find out with these cards-that much I do know.